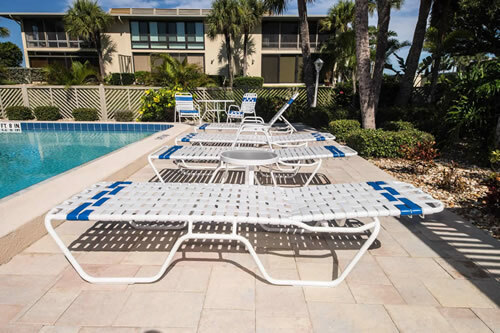 Vinyl strap patio furniture from A&K Enterprise of Manatee, Inc. is in use at waterparks, resorts, and community pools worldwide. As the manufacturer, we offer our strap patio furniture direct to the public at discount prices. Shop our many styles of vinyl strap lounge chairs and strap patio chairs. Each item is made-to-order in the frame and strap colors of your choice. All items are from our commercial aluminum pool furniture collection and have a commercial warranty. The frames are made from extruded aluminum tubing and are powdercoated with TGIC polyester powder. The 2-inch wide vinyl straps are attached with solid shank nylon rivets and double-wrapped. Strap outdoor furniture is perfect for use at home or as apartment pool furniture. We offer our strap furniture at a discount to help offset the shipping cost. Please click VIEW DETAILS to customize options and request a shipping quote.